Refugee advocates have joined Palm Sunday rallies around the country calling for an end to offshore detention. Source: SBS News. 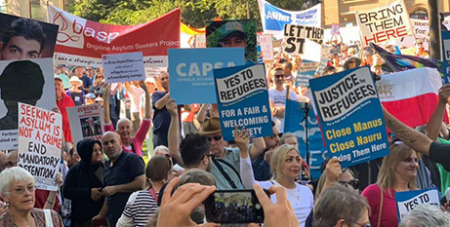 Protesters brandished signs with messages including “Bring Them Here”, “Vote Humanity Not Atrocity” and “Say Yes To Refugees” as demonstrations were held in a number of capital cities and regional centres around Australia on Sunday. Uniting Church Reverend John Barr said saying yes to refugees was not only “the decent, fair or honourable” thing to do, but it was also the right thing to do. In Melbourne, at least 1000 people took to the streets, with members of different faiths and beliefs shouting “shame - get them off” and “we will prevail” as they marched. Marchers of all ages came together, including grandmothers dressed in purple and students from St Bernard’s College and Wesley College.